Fun February Facts: Feb 22nd is Founders’ Day (Scouts’ Day) and National Margarita Day, the day Frank Woolworth opened the first of many of 5 and dime Woolworth stores in 1879, when Grover Cleveland signed a bill admitting North Dakota, South Dakota, Montana and Washington as U.S. states in 1889, when President Calvin Coolidge became the first President to deliver a radio broadcast from the White House, the day the Miracle on Ice happened in 1980 and the birthday of George Washington in 1732. Brain Health 1 covered the 3 main brain antioxidants (melatonin, DHEA and oxytocin) and Brain Health 2 covered how to keep the brain stimulated and make new connections. Part 3 looks at what to feed your brain for optimal function. As discussed before, the brain is an incredibly complicated organ and system that relies upon many things for optimal function. Aside from needing good housecleaning and constant stimulation, it needs the nutrition and building blocks to repair, regenerate and stay healthy. These are all likely pretty good foods for our mental health but that’s because they’re just good foods in general. I look at feeding the brain the same I do with other things. Start simple and then work your way into the details later. The body needs to be fed well first and then focus can go to the specific nutrients the brain seems to really thrive on. Eat a balanced, whole food diet as a starting place. What’s good for your body is good for your brain. 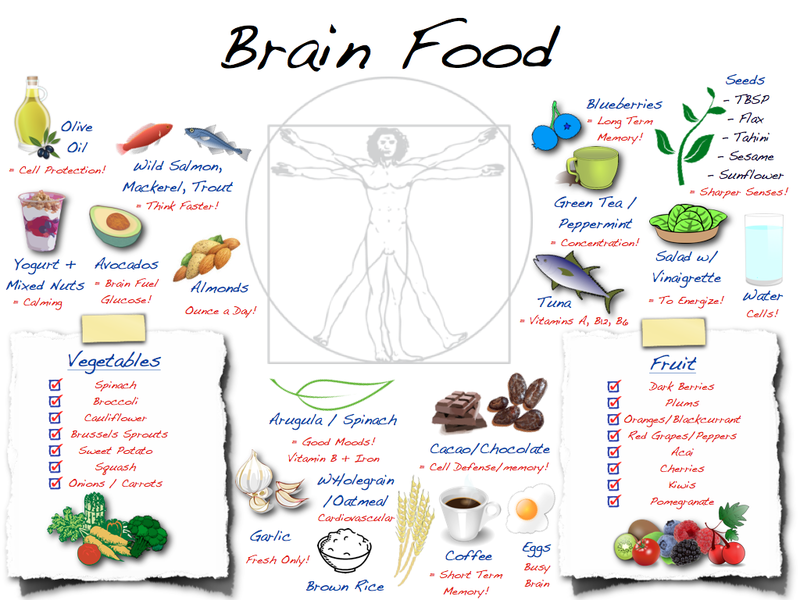 Focusing on brain specific foods before you have your basic nutrition down doesn’t do you that much good. The more nutrients you can provide your brain the better it will function. Think about eating all kinds of animals and plants and eating as much of the whole food of each that you can. The guide above is a nice example of getting whole food variety, particularly in the plant department. Add a little more animal variety and you’d have a pretty well balanced diet. Note: The further you move away from balanced and into restriction the more powerful the impact may be but the less likely it will work. 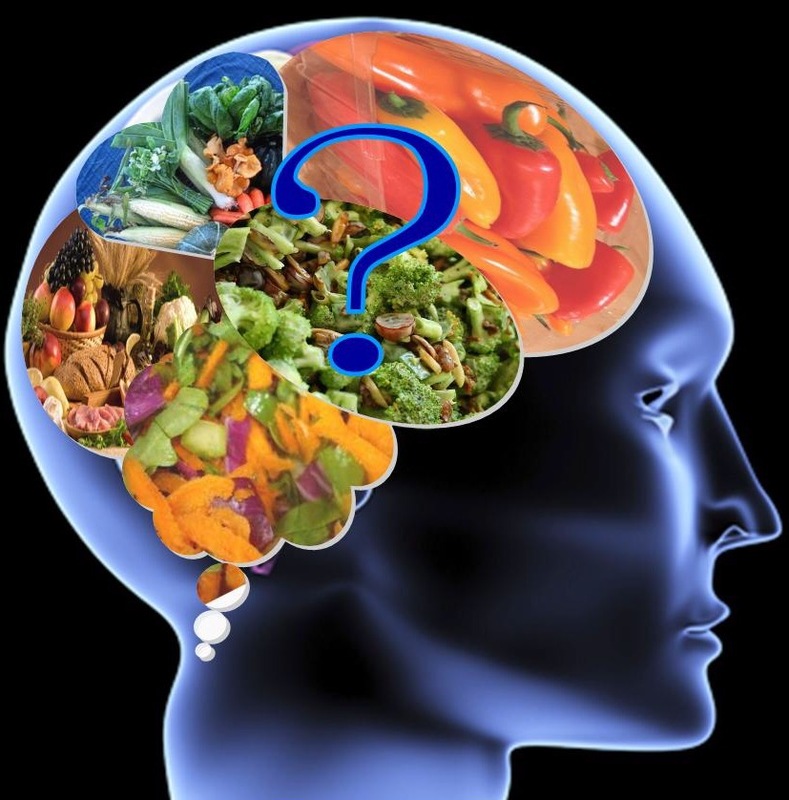 High carbohydrate diets are lauded by some but heavily criticized by many and are, unless really well thought out, particularly suspect for causing brain problems and often blamed for brain deterioration and many mental conditions and disorders (Alzheimers). Extremely low carbohydrate and Ketogenic diets can be extremely helpful for some but, once again, unless well formulated tend to work best only for a small percentage of people. These categories of “food” tend to be the most inflammatory to the body and many people think the negative impact they have on brain is one of the reasons why. Not surprising, these things are loaded into processed food/food products/food-like substances. Limiting your processed food is the best way to limit these in your diet. If you were to look into each of these individual nutrients you could find several other foods that are good sources but since I like to look for foods that provide a big nutrient bang for the buck, the big thing that stands out to me is how much seafood pops up, particularly the fatty and shell fish, as well as meat/organ meats and dark leafy greens like spinach. Lentils and seeds pop up a couple times as do eggs. For me, those are the ones to focus on adding if you want to get a little more specific brain nutrition. If not, a nice, balanced, whole food diet will get all your bases covered which is probably the most important thing when it comes to diet and the brain. Aside from adding a bunch of turmeric to your eggs and sauces, look into these in good detail before deciding to add them into your regimen. I don’t take anything but these are popular (and pretty safe) for people looking for a little extra mental boost. My thought with supplements is that if you’re doing a good job from a diet and lifestyle perspective, then this is only for the fringe population or people with a health challenge. – A generally balanced (plant and animal) whole food diet is the starting place for everyone. – Limit intake of sugar, chemicals and industrial oils. – Increase intake of things like seafood, organ meats, eggs, green leafy vegetables, dark fruits and, of course, chocolate. – Supplement only if necessary and well thought out. P.S. Next up, in Brain Health 4, we look at sense. Previous Is Cholesterol Finally Off The Hook?